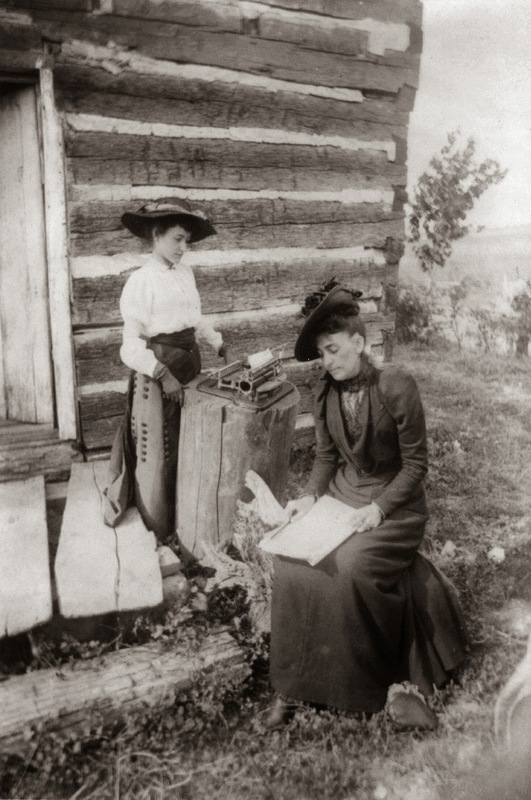 Indianapolis stenographer Mary Elizabeth Coleman at a Hammond typewriter, taking notes from Caroline Eleanor "Norah" Gridley outside the Lincoln Log Cabin at Goosenest Prairie, Illinois, on August 9, 1891. 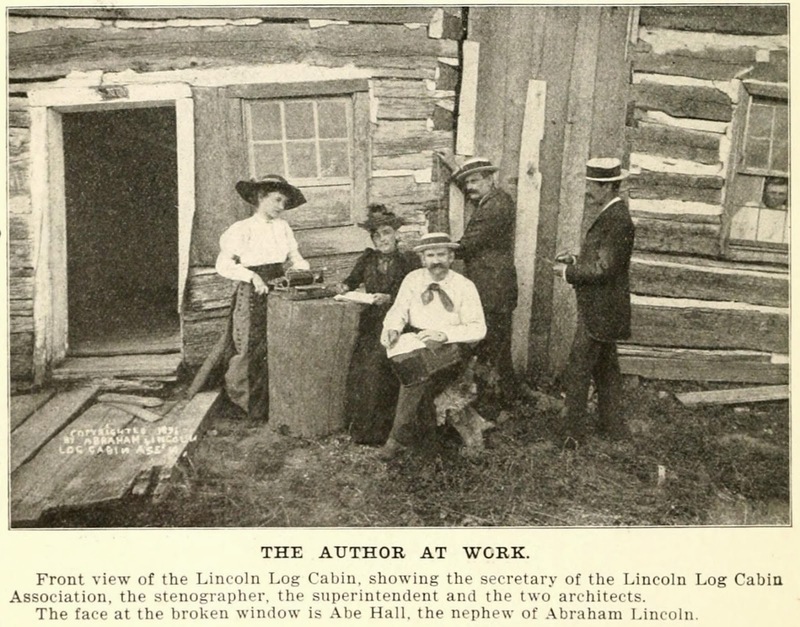 Also shown are the project superintendent, Nelson Stelle (1852-1946; the New York-born, Chicago-based manager is using the Hammond typewriter's case to write on) and the architect brothers the Megars, assigned to take measurements and notes on the construction of the Lincoln cabin before it was to be dismantled, transported and reassembled in Chicago. Abe Hall, then 24, a great-grandson of Abe's father Thomas Lincoln, is seen looking through the window of the east room of the cabin. The original book. Below, a later edition. 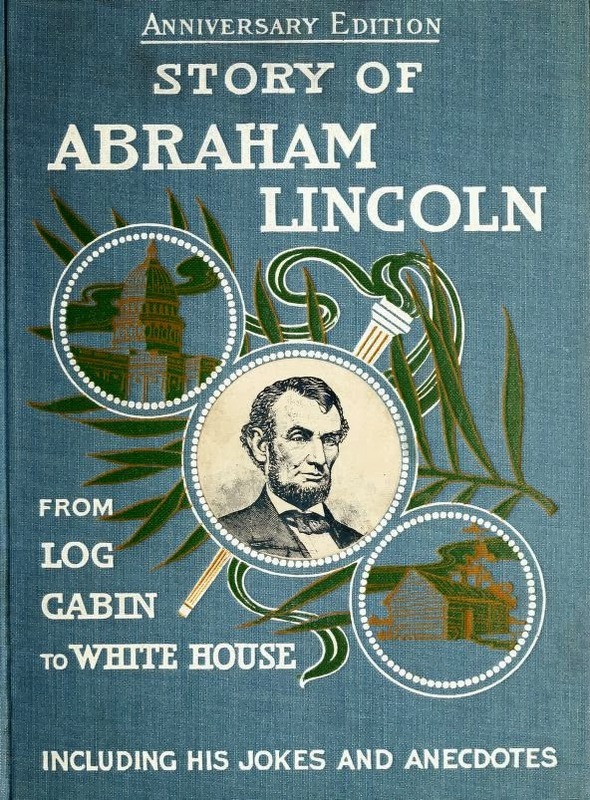 What did become of Abraham Lincoln's log cabin? Did it suffer the ultimate indignity - being used for firewood in Chicago before (or after) the World's Fair-Columbian Exposition of 1893? Or, perhaps worst still, was it dumped out at sea? 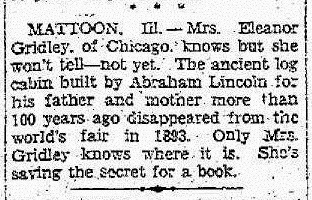 And why was it destroyed - to hide the evidence of American embarrassment over Lincoln's "humble beginnings"? Surely not! By the 1930s, only one person claimed to know the answers to these questions - a woman who as a 12-year-old girl had taken part in Lincoln's presidential campaign in 1860. 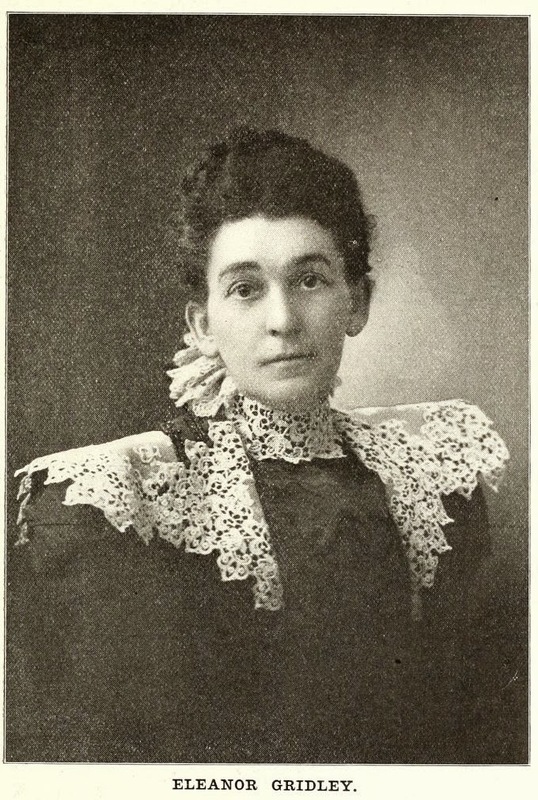 She was Caroline Eleanor "Norah" Gridley, who had purchased the cabin and its site in 1891 with the idea of using the cabin as an exhibit at the World's Fair. 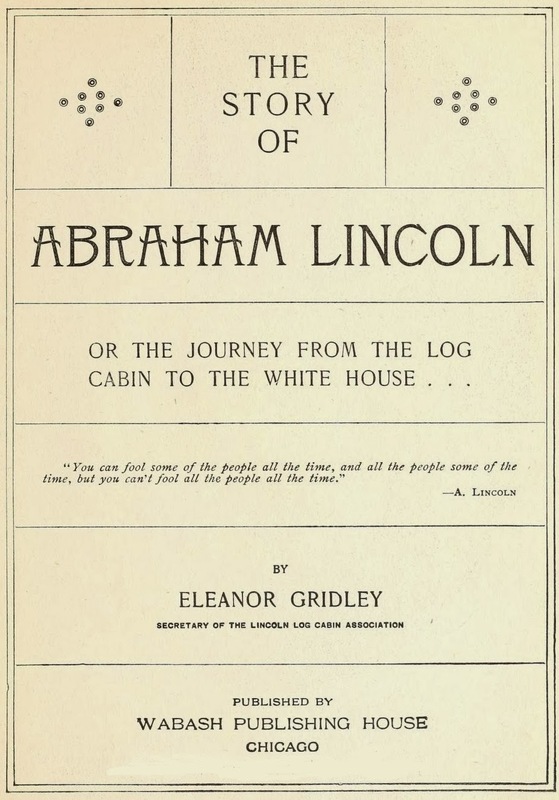 In buying the cabin and site for $10,000, Gridley was acting on behalf of the Abraham Lincoln Log Cabin Association of Chicago, for which, as its secretary, she was an appointed agent and researcher. The cabin was dismantled from its original site, outside Lerna in Illinois, and taken to Chicago in 1892, the year the Columbian Exposition was supposed to have been staged, marking the 400th anniversary of Christopher Columbus' arrival in the New World in 1492. 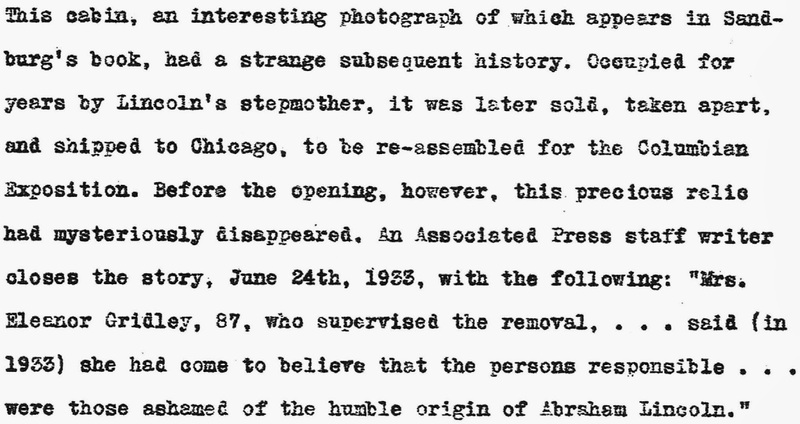 The clearest outline of these events is provided in Charles H.Coleman's 1955 work Abraham Lincoln and Coles County, Illinois, which can be read online here. Coleman was a professor of social science at the Eastern Illinois State College, Charleston (now Eastern Illinois University). It's such a shame his meticulous research standards have not been maintained by scholars at that institution. 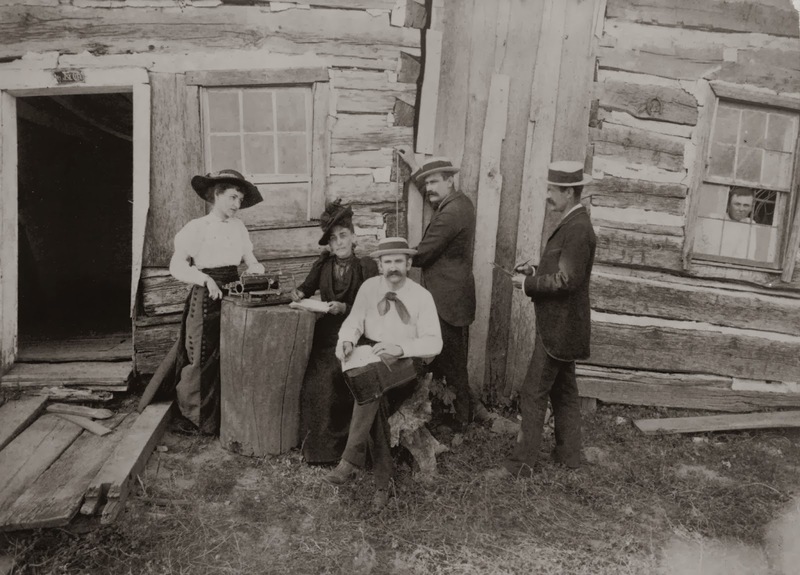 Let me fast-forward and explain my quest for information about this 123-year-old saga - an interest which now extends way beyond the use of the Hammond typewriter at the original cabin site in 1891. As an old-fashioned historian, one who puts great store in primary sources, I am always amused and amazed in equal measure when young academics feel compelled to deconstruct and reconstruct history to suit their own motives. "Norah Gridley, seated front, was a cousin of Mary Ann Todd Lincoln, wife of President Abraham Lincoln. She is seen here in front of the Lincoln Log Cabin, near Lerna, Illinois, with Miss Mary Coleman using a Hammond typewriter." Henderson boldly stated, "The lady's name is Eleanor Gridley and she was of no relation to the Lincolns." This, apparently, is the strength of her assertion that I should make a correction. Sorry, Lori, but you are wrong and I am right. My research has been pretty thorough on this. The photographs were taken by Chicago photographer William Joseph Root (born Gustavus, Ohio, December 1854) of the Root Studio, Kimball Hall, 243 Wabash Avenue, Chicago, on commission from Gridley. The images are now in the Library of Congress, and, easily downloadable, are being offered by unscrupulous online sellers, profiting from the library's generosity in making them freely available to the public. The point here, though, is that these photographs were captioned by Root at the time he took them, and it is from these 1891 captions that we know Gridley was a distant relative of Lincoln's wife, Mary Ann Todd "Molly" Lincoln (1818-1882). 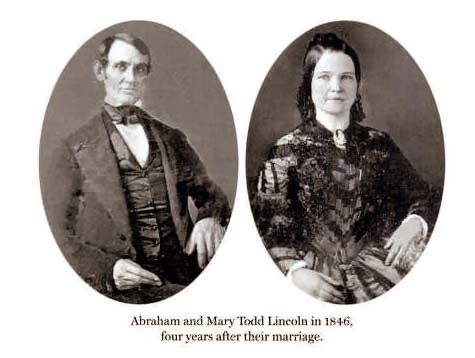 Gridley's mother was Caroline Wealthy Todd (1816-1891), whose father, John Robert Todd (1773-1850), was directly related to Mary Ann's father, Robert Smith Todd (1791-1849). 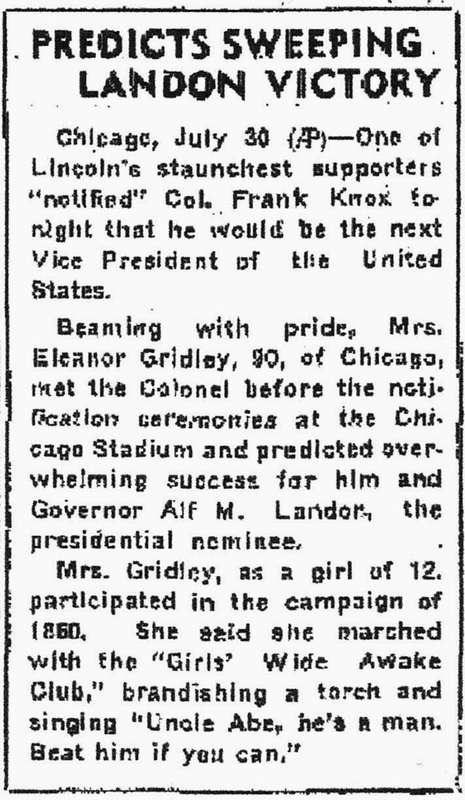 As not just a distant relative through his marriage, but also as a keen supporter of Lincoln, Gridley had known the president since she was a child. Gridley was born the daughter of Grandison Thompson Gridley (1816-1889) in Jackson, Michigan, on June 18, 1846, and died in Chicago on April 29, 1944, aged 97. In Jackson in 1867, aged 21, she married a cousin, William Seward Gridley (1838-1889). Professor Coleman wrote: "It was Mrs Gridley who persuaded John J. Hall to part with the property, according to a description of the Association and its activities which appeared in the Chicago Tribune in 1892. 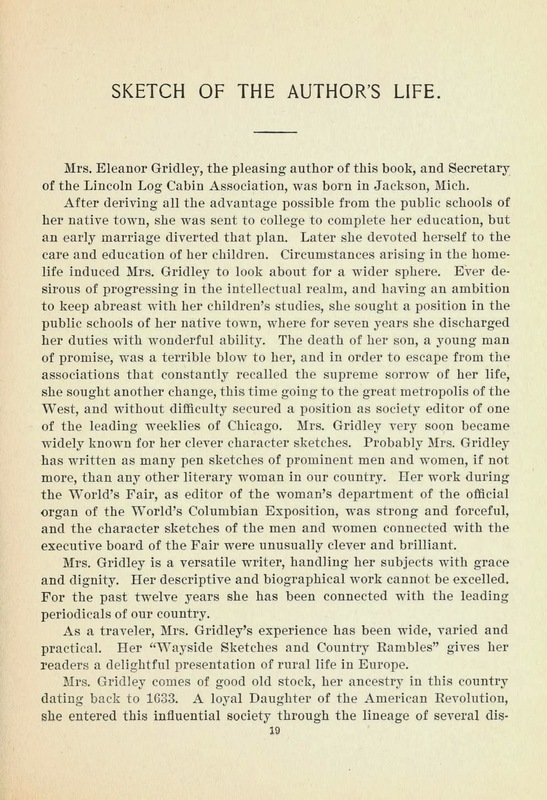 This account states that when Mrs Gridley went to Coles County in June 1891 and visited the cabin, she persuaded Hall to sell it. If this statement is correct there must have been some red faces in the Abraham Lincoln Log Cabin Association when it was discovered that Hall had sold the cabin to Craig the preceding May for $1000, and that Craig was holding it for a mere $10,000! "It was the original intention of the Association, according to the Tribune account, to enclose the ground upon which the cabin stood with a neat fence, and to erect a monument to mark its location. The kitchen garden, which Sarah Bush Lincoln had tended in earlier years, also was to be preserved. Nothing came of this alleged project. "On January 18, 1892, the Association sold the cabin site to [Myron Eskin] Dunlap for $1000. Thus the cabin and the site eventually sold for a total of $1 1,000, of which John J. Hall received only $1200. In retrospect, the various transactions appear to form the pattern of a money-making promotional venture. As shown by the deed records, John J. Hall was bought out early in the game. James W. Craig cleared $9000 on the deal, at the expense of the Chicago promoters. 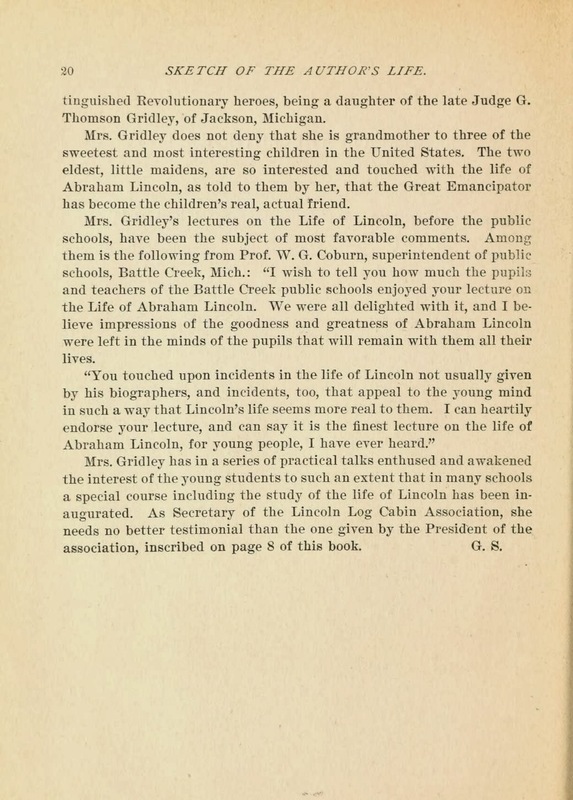 "Many years later Mrs Gridley told of her activities with the Abraham Lincoln Log Cabin Association. At the time of the interview with her (1937) Mrs. Gridley was 91-years-old, and her memory played a few tricks with her. "At Chicago the cabin was set up close to the Fair, but was not officially a part of it. As Mrs Gridley stated, the cabin was visited by thousands of people. "After the Fair it was dismantled. At first it was proposed to place the cabin in a suitable permanent building, thus making it, in the words of the Chicago Tribune, "one of the permanent attractions in Chicago." This project was not carried out, and the cabin was stored in the yard of the Libby Prison War Museum on Wabash Avenue. It remained there for a few years, and about 1895 or 1896 the War Museum managers inserted a notice in the Chicago papers calling upon the owners of the cabin to remove it or it would be sold to pay charges or donated to some historical or other society. "About this same time there was a project on foot to bring the cabin to Washington DC for permanent exhibition. 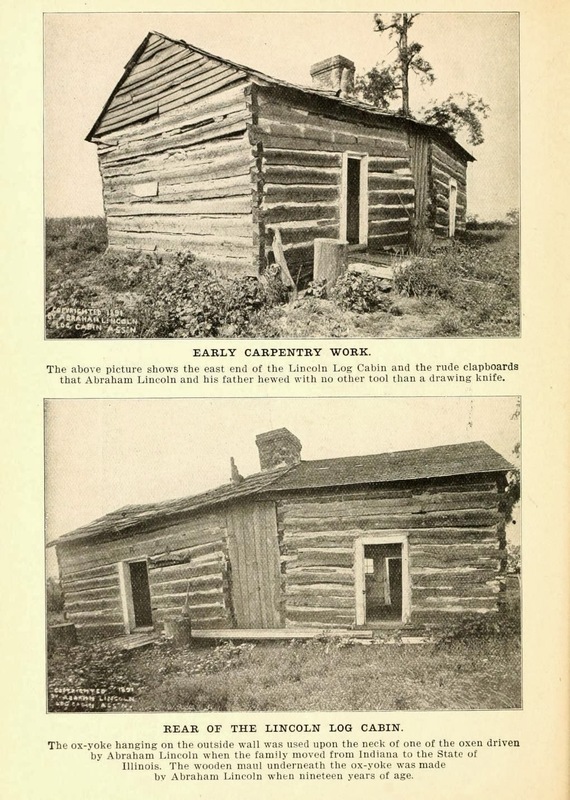 The Washington Post for August 16, 1896, reported that "The Lincoln cabin is now in Chicago, but it is but the question of a short time before it will be brought on and erected in Washington. "This project, with which Dunlap, owner of the cabin site in Coles County, was associated, was never carried out, and some time after the appearance of the items in the Tribune and the Post the cabin disappeared. There is some reason to think that it was used for firewood. 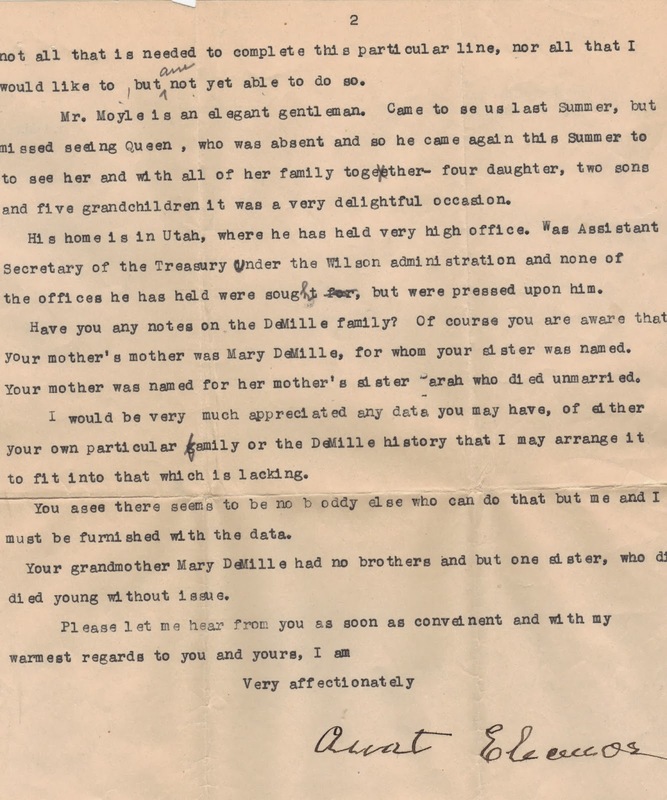 "Following the death of Dunlap the 36/100-acre cabin site became the property of Erskin S. Dunlap of Pennsylvania, who, on January 1, 1929, conveyed a quit-claim deed to the property to Mrs Gridley for one dollar "and other good and valuable considerations." 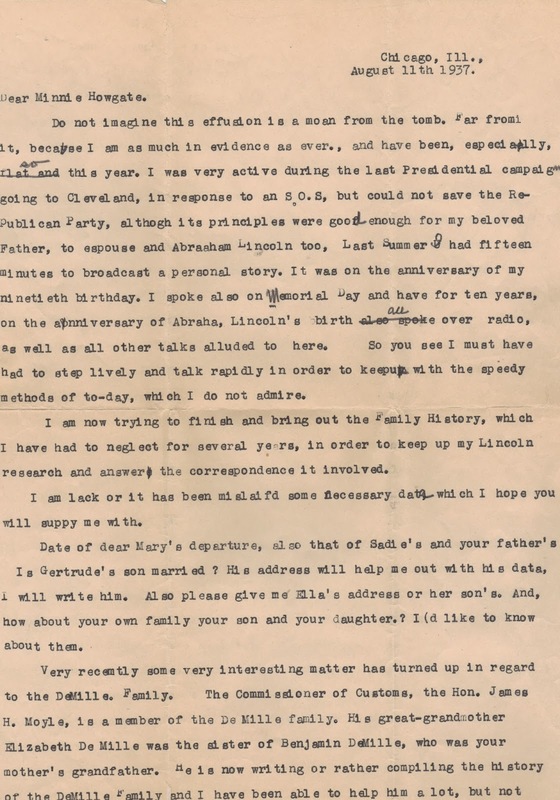 "In a letter to Dr Louis A. Warren, dated October 2, 1936, Mrs Gridley wrote that in September 1929 she conveyed her interest in the cabin site to the State of Illinois, "without money or price." 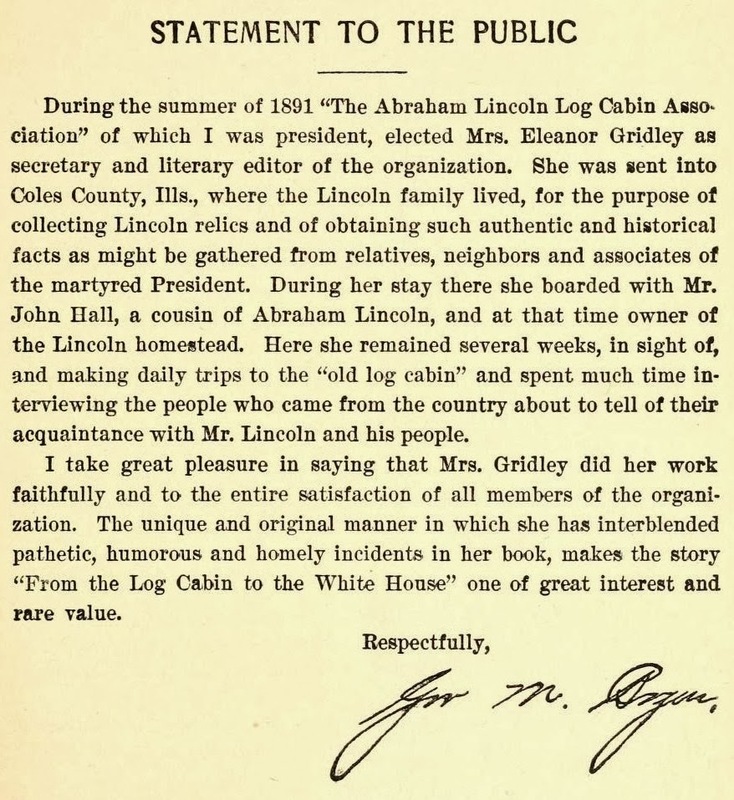 She mentioned that her part in securing the cabin site for the State of Illinois was not referred to at the dedication exercises of the Lincoln Log Cabin State Park on August 27, 1936. A search of the Coles County deed records fails to disclose any record of the gift which Mrs Gridley told Dr Warren she made to the State." 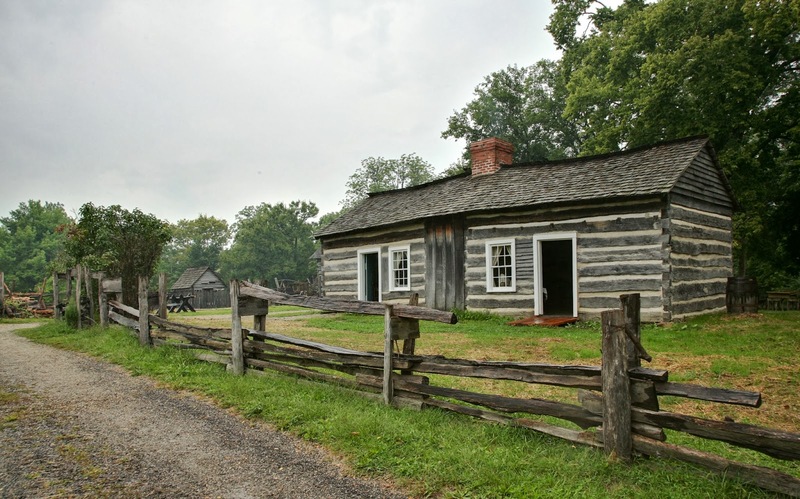 "The Lincoln Log Cabin State Historic Site is an 86-acre history park located eight miles south of Charleston, Illinois, near the town of Lerna. Its centerpiece is a replica of the log cabin built and occupied by Thomas Lincoln, father of US President Abraham Lincoln. The younger Lincoln never lived here and visited infrequently, but he provided financial help to the household and, after Thomas died in 1851, Abraham owned and maintained the farm for his stepmother, Sarah Bush Lincoln. The farmstead is operated by the Illinois Historic Preservation Agency. 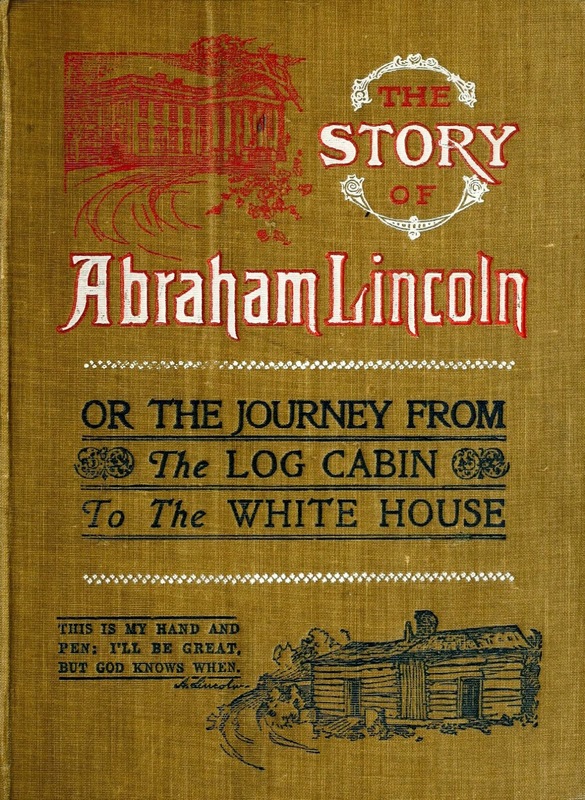 "In 1893, the original Thomas Lincoln log cabin was disassembled and shipped northward to serve as an exhibit at the World's Columbian Exposition in Chicago, Illinois. 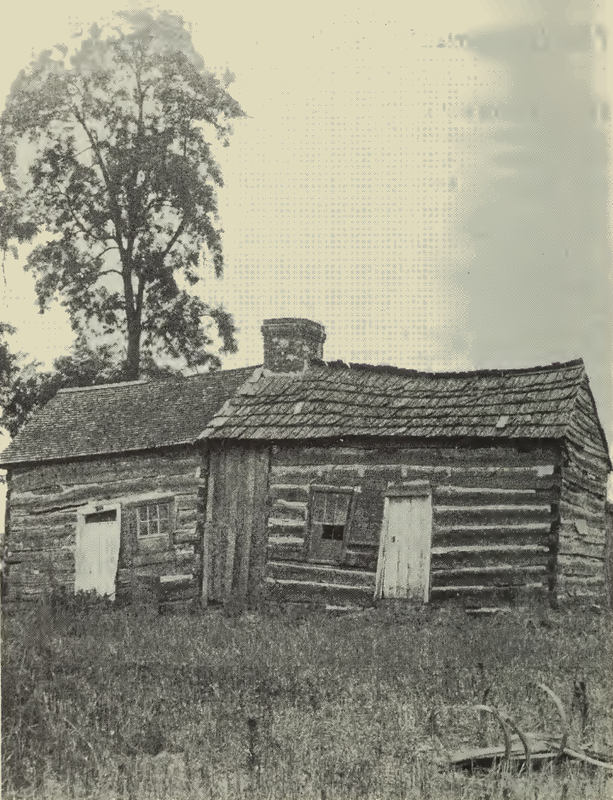 The original cabin was lost after the Exposition, and may have been used as firewood. However, the cabin had been photographed many times, and an exact replica was built from the photographs and from contemporary descriptions." The photo of Mary and Norah outside the cabin is very nice. Thanks for an interesting article - once again. And for the links.